Sunday September 23rd the Florida Cricket Conference held the Finals for the Rudy Latchman Summer Slam T20. After almost 6 months of T20 cricket which saw 16 teams in 2 divisions compete in FCC’s flagship event and the Champions were crowned! 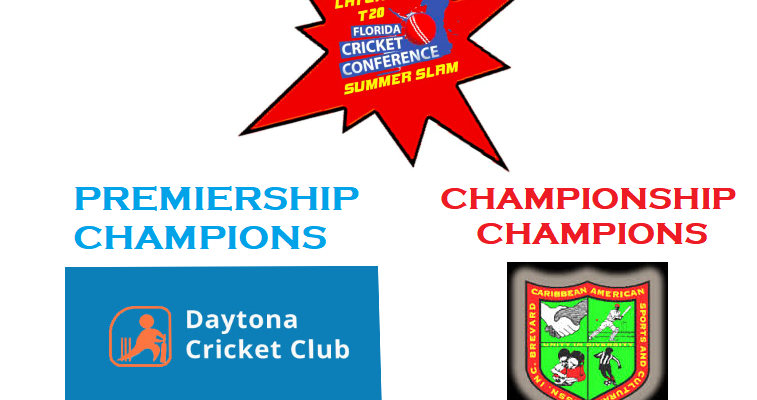 The 2 Finals saw Palm Bay Cricket Club v Clermont Cricket Club in the Championship Division and Daytona Cricket Club v Strykers Cricket Club in the Premiership Division. The Championship Finals pitted league table topping Palm Bay against the second seeded Clermont, both clubs have been dominant in the league and their first meeting in the regular season resulted in a Palm Bay win. As the match started, Palm Bay batted first and got off to a slow start and lost their first wicket in the 4th over for only 13 on board. The match progressed with periodic wickets and saw Palm Bay bowled out for 101 in the 20th over with Mark Pinnock leading all scores with 36. The target was set and Clermont looked like they were on top but all season long Palm Bay has had a strong bowling unit, and that was the case as well on Sunday. As Clermont’s innings started Palm Bay bowlers struck quickly and often restricting Clermont to the mid 30’s for the loss of 6 wickets when the rain came in the 9th over. With the weather looking gloomy, the cricket gods pushed the rain off after approximately 40 minute delay and a recalcuated target of 38 in 3 overs. Palm Bay was laser focused and took the remaining 4 wickets quickly by skipper Conroy Jacobs to claim the Championship Trophy! The Premiership Finals pitted uber talented Daytona Cricket Club against an upstart Strykers Cricket Club who the week before upset the favorites Orlando Cricket Club. The Strykers won the toss and elected to bat to use the heat to their advantage in the hopes to tire out the vaunted Daytona batting line up. The Strykers innings started slow and cautious with 10 runs in 2 overs as the Daytona bowlers kept their lines and lengths tight. In the 3rd over Strykers lost one of the openers which led to a carnage where wickets tumbled as often as a cheer contest. By the end of it all the Strykers were bowled out for 53 in the 15th over with only Praveen Bora and Vinay Inala making it to double digits, 22 and 11 respectively. In Daytona’s reply, they comfortably attained the total inthe 12th over with the loss of one wicket of Babar Arshad (13) runs. Daytona captured the Premiership Trophy, their second consecutive championship as they previously captured the Big Blast 30 hardware over the winter.